Based on the Stanley No. 48 and 49, our Tongue and Groove Planes are more heavily built for sound performance with a very thick blade. Also, rather than having two separate blades, ours is a single forked blade that registers on the milled body casting to ensure squareness and equal depth of cut on both sides. Since this is a heavy stock removal tool, no fine depth adjuster is needed.The blade is 3/16" thick O1 steel. The fence is attached to the base with a center pivot screw and can be rotated and locked in tongue-cutting or groove-cutting positions. Centers on ¾" stock, leaving a ¼" wide tongue and .3125" deep grooves. On narrower or wider boards, the tongue will be offset from center, but still hidden within the joint. 2.90 lbs. 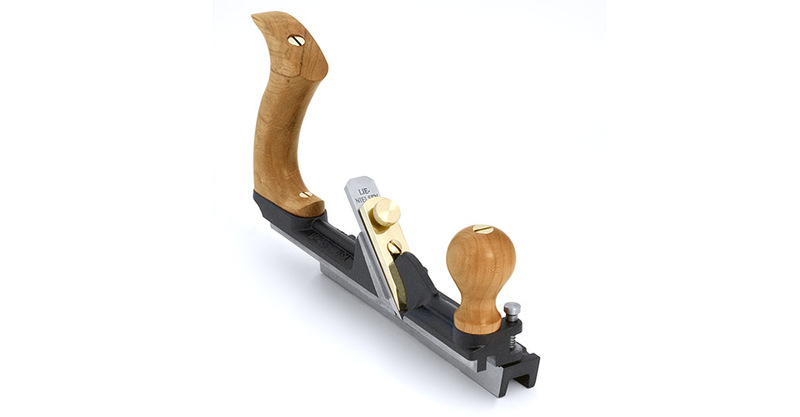 A companion Tongue and Groove Plane, is made to center on ½" stock. It will cut a .166" wide tongue and .230" deep grooves. 2.35 lbs. Pull the locking pin at the front up to disengage from the fence. Swivel and lock the fence to switch from cutting either a Tongue or a Groove. 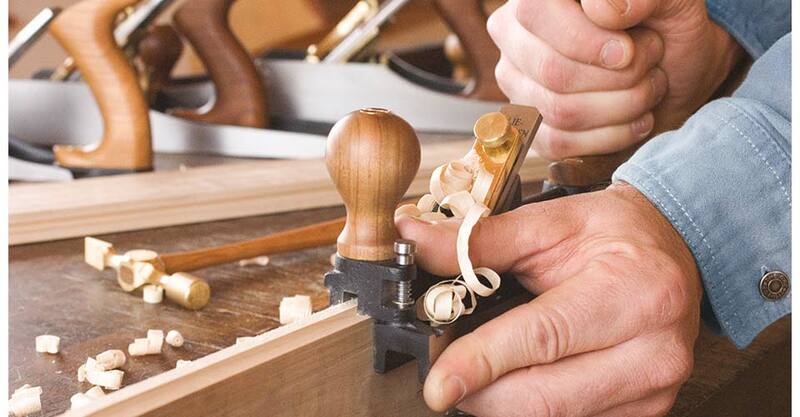 To ensure straight cuts it is best to start the cut at the far end of the board. Start the second cut 6"-10" back from the first and repeat until you are taking a full length cut. Hold the fence firmly against the work until the full length cut is established. 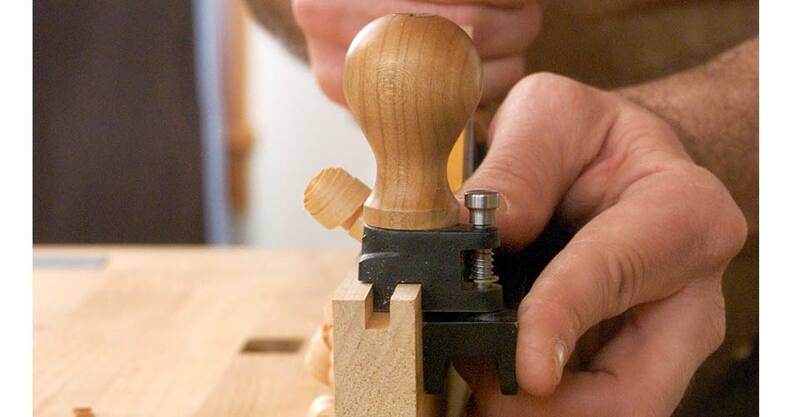 It is best to start work by cutting the tongue, and finish with the groove, in case your blade has dulled a bit. The quality of finish on the groove is less important. The blade is bedded bevel-down at 45°. The one-piece blade fits tightly on a milled track on the body casting. To adjust depth of cut, set by eye and take a test cut. Tap the back of the blade with a small hammer to increase depth. These tools are meant to take a thick shaving. The body is cast from Ductile Iron, a very strong alloy that will take a lot of abuse. These castings are fully stress-relieved, a process that removes inherent stresses and ensures that the tool will remain flat and true. The blade is O1 Tool Steel hardened to Rockwell 60-62. Cherry knob and handle, other parts are Brass and Stainless Steel. Tools with Iron bodies should be kept lightly oiled or waxed to prevent rust. We recommend Jojoba Oil, a plant based oil product that is non-toxic, odor-free and easy to use. 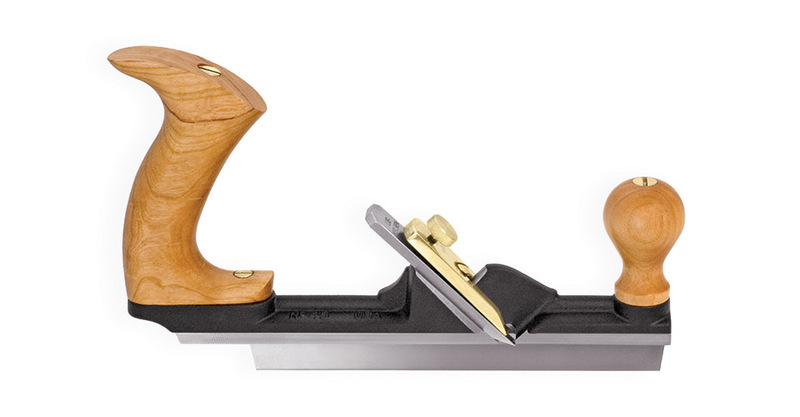 Also, in our shop, we use a fine abrasive handblock to remove any light surface oxide from tool bodies and blades. Jojoba Oil and abrasive handblocks are available from us.